Due to the lot of falloff dirt on other surfaces and the ground, general dusting and wiping is the first part of our end of tenancy cleaning. Prioritizing it allows us to maintain good speeds and efficient results. Remove all spots from walls, if possible. Per request. Extra charge applies - £15 per room. Dirty furniture leaves a horrible first expression. Thus, our workers spend their time to carefully wipe, vacuum and clean all furnished and unfurnished furniture in the property. Carpets are some of the hardest items to clean. 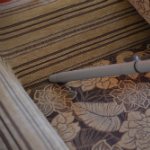 Note that services requiring the need of our professional carpet cleaning machine are not part of the end of tenancy cleaning, but can be provided per request and extra charge. 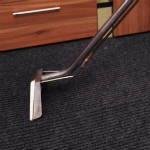 In-depth professional carpet cleaning comes at 50% discount when booked with end of tenancy cleaning. Check out our deals and packages! The workers perform all kinds of job within the bathroom. The toilet, shower, tiles and bath tub are all deep cleaned and brought to perfectionm as the bathroom is one of the places where dirt is most visible and least tolerable. 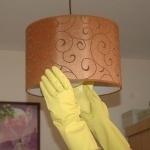 Everything within the premises is part of the end of tenancy cleaning service. Naturally, in inside of the windows is not an exception. We will clean and wipe down the windows until they are as clear as thin air. Tenancy cleaning is discounted by 15%, if booked with outside window cleaning. If accessible from the inside, outside of windows can be cleaned for £10 per room extra charge. Blinds can be cleaned per request at the price of £10 per blind. 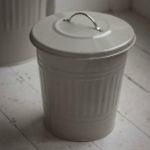 It's easily forgettable to clear a drawer or clean the far back corner of a shelve you barely reach. The cleaners will check each cupboard, drawer and shelve individually. They will also have a step ladder in order to reach everywhere. We thoroughly clean the fridge and freezer. Please note that in order to clean the freezer property, it needs to be defrosted, or at least turned off a day in advance. 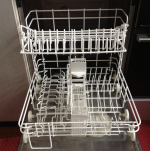 We will clean the dishwasher carefully from all food and soap deposits. Additionally, we'll provide a preliminary check up on the rubber seals and internal components. 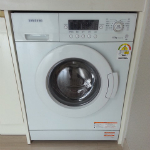 Similarly to the dishwasher, our cleaners will thoroughly clean and wipe the washing machine, as well as check on the seals. 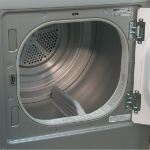 The tumble dryer is also cleansed as part of the end of tenancy cleaning service you have booked. The oven is an extremely important part of the move out cleaning procedure as it can leave both great and horrible first impression. 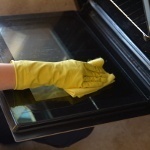 Special attention is turned to thoroughly cleanse and clear the oven as to be ready for the new tenants of the property. The microwave is also thoroughly cleaned in the same fashion. 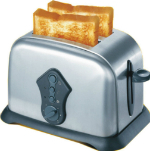 Not even the toaster is neglected when coming in for a tenancy cleaning session. 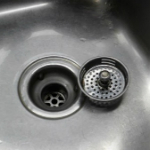 All sinks and units, regardless if they are stainless steel, ceramic or made of other materials are thoroughly treated. We carefully clean and polish them to return their original shiny surfaces to life. There are a lot of random small tasks that don't have their own category. But, don't you even think we've forgotten about them, as any little detail counts towards getting that deposit. Move Out Mates is a company providing high quality services and a deposit-back guarantee.